AOL’s MapQuest may be the market-leading map site by a long shot (with 50 million monthly visitors versus 30 million for Google Maps), but it is still playing catch-up when it comes to features, functionality, and mash-up capabilities. 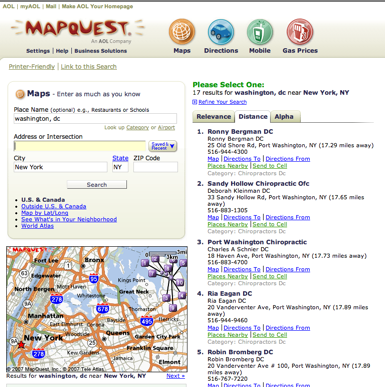 Today, it finally took a big step into the modern Web era with the launch of MapQuest Beta. This is not just a sandbox where MapQuest can safely play with the newest Web 2.0 toys. It’s the new face of MapQuest and by the end of the year will take over the main site, which still remains a very 1.0, page-based destination. 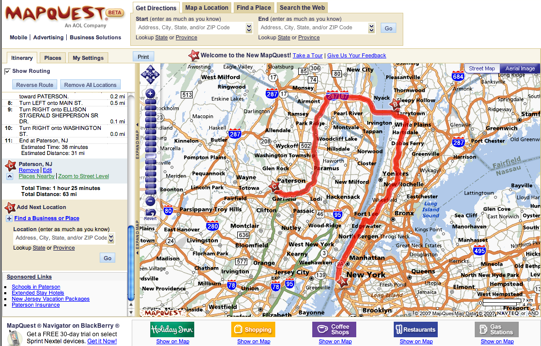 MapQuest Beta, in contrast, is built on Ajax, and is thus more of a single-pane experience. I got a sneak peek. Despite the improvement, the new MapQuest is still pretty bare bones at this point. You can see the map and driving directions in different panes on the same page, and can also create routes for multiple cities (same as on Google Maps). Or, you can collapse the directions pane so that the map covers the entire page. The search and navigation has been simplified to a one-box approach. You can save maps and routes, and share them with people. And you can print out the exact map image easily at the zoom level you want. There is nothing earth-shattering here, but it adds up to a much-needed upgrade for MapQuest. You can read more details here on the new MapQuest Beta blog. Over the next few months, though, expect to see new features rolled out at a rapid clip, about every two weeks You will soon be able to drag the location pins around to read what’s underneath (they will remain connected to the spot they are marking by a thin line). The maps will become embeddable in other sites. Live traffic updates will be added. And people will be able to annotate the maps. Again, many of these features are already available on Google Maps or Yahoo Maps. 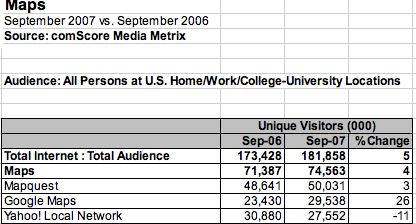 But MapQuest still has the biggest market share, and that share is not yet declining (see chart). Given all the innovation going on with online maps these days, that market share is extremely vulnerable. Now MapQuest will be based on a new technology architecture that hopefully will allow it to respond more nimbly to the incredible diversity of map features and applications that are out there. Still, don’t expect it to do anything too crazy. It’s got 50 million mainstream users that it does not want to alienate. My prediction is that it will remain very much focussed on driving directions and other routing applications, which is its strength. I don’t think we’ll be seeing too many geo-tagged videos on MapQuest. Instead, it will deploy Web 2.0 features to improve its core mapping functions and deepen the loyalty of its existing users. Imagine how grateful they will be when they realize they no longer need to be stuck with a user interface from 1999.